As you can imagine, I've been steadily trying to catch up on. . .everything since dealing with vision issues and moving and whatnot. In going through my feedreader, I've stumbled on some cool, creepy, and neat Halloween ideas that I thought I'd share with you before the actual day gets here. You know, give you enough time to make one of these projects or at least think hard about them. These pumpkins with the doorknob tops are so cute and vintage-y. And, they look pretty easy to make too - BONUS! I'm obsessed with Tim Holtz products and have always wanted to make a little Halloween collection of apothecary/witches jars so this Undertaker's Parlor that combines both totally appeals to me. More pumpkins and upcycling! Again, these are made so easily and from thrift store finds. I might just have to make a few. Now for a few projects on the spooky side. . . This first one is kinda labor intensive, but it looks like the results might be worth it! Seriously, a full-body ghost in your front yard!? Want! A friend of mine actually made a set of these floating crystal ball candlesticks before I even saw the link in my feedreader. She did different images in hers but I like that the tutorial includes printable images to make it easier for you. I think they're pretty awesome. Lastly, something a little less spooky. . .and yes, pumpkins again. But these are faux quilted pumpkins. For real, they are NO-SEW patchwork pumpkins. So adorable! That's what I've stumbled across so far. I'm sure there are tons of other amazing projects and foods and costumes and gosh knows what else that I've missed and haven't gotten to yet. But, I did need to share these. Remember that if you want to pin or save these projects, I ask that you go to the original source to do so. What are some cool projects that you've made for Halloween? Help me catch up! Love the Undertaker's Parlor Hope! Hope, I love this post! 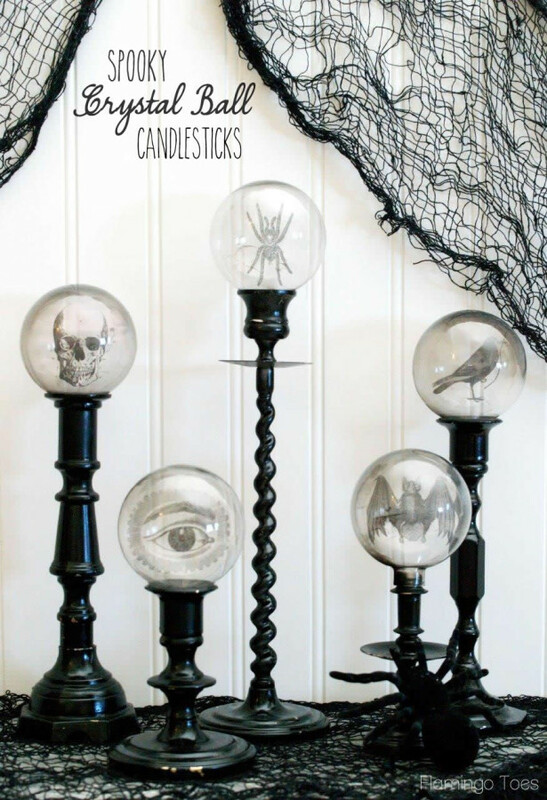 I am obsessed with Halloween and spooky décor and you have given us some great ideas. I also found a kit on polymer clay tv blog. Can't remember if you work with polymer or not but I have just begun to work with it and discovered this blog with so many great ideas! I shared a link on my FB page for the "shrine" kit, a spooky little niche that looks like such fun. I really love the projects from thrift store finds. I've done lots of candlestick "fairy towers" for my summer garden so finding the Halloween ones just adds to my reasons for haunting thrift shops. Thanks! The crystal balls would look pretty any time of the year with other images. Clicking over now to check it out. Thanks for the good tips!